This gluten free vegan green bean casserole is so delicious, you with think it’s the recipe that your grandma used to use! You really don’t need gluten or dairy to make this casserole creamy and delicious! I must admit, green bean casserole was one of my favorites on Thanksgiving and what I requested anytime that my mom let me choose a meal as a kid. I went years without having it after I became vegan, until I realized that I could just use my homemade vegan cream of mushroom soup to make a vegan green bean casserole. Who can I find gluten free fried onions? When we went gluten free, I thought that I would have to leave the onions off the casserole. That is, until I found gluten free vegan fried onions at Aldi! (Sprouts also has them and you can order them on Amazon too)! If you are feeling ambitious, you can make your own with this recipe from Simple Vegan Blog. How can I make a gluten free vegan green bean casserole? Start by making a pot of cream of my cream of mushroom soup. (When making the soup for the casserole, increase the corn starch by 2 TBS and add 1 TBS of gf soy sauce. The extra corn starch will make it thicker and hold together better in the casserole). Fill a casserole dish with 3 cups of fresh or frozen green beans. Then, simply pour the soup over the green beans (I used frozen in the picture). Sprinkle the top with gluten free fried onions, and bake at 375°F for 35-45 minutes. (Baking time will depend on the size of your beans and if you have started with fresh or frozen beans. Let it cool down and firm up for about 10 minutes before serving. If you don’t want your fried onions to be to browned, sprinkle them on after you bake the casserole for about 25 minutes. If you need the casserole to cook faster, blanch the beans in boiling water for about 5 minutes and then drain before adding them to the casserole. This will cut the cook time by about 15 minutes. The petite french beans will also cook faster than the large green beans. You will know when it’s done, when the casserole is bubbling and you can easily stick a for in your beans. If you don’t like fried onion or can’t find them, you can sprinkle crushed up crackers of choice on top. This is sure to be a hit with the gluten/dairy free people at your Thanksgiving table or as a side any day of the week! 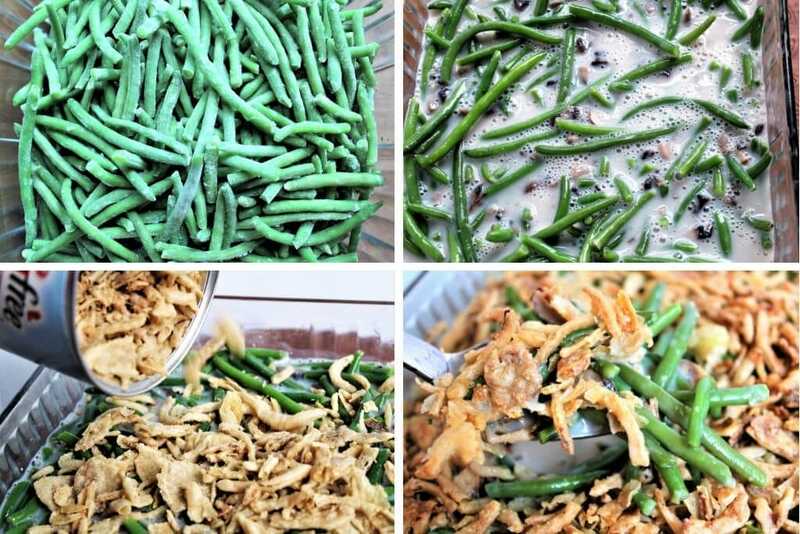 Did you make this gluten free vegan green bean casserole? Leave a comment and let me know what you think. A classic green bean casserole without the dairy or gluten. The perfect side for your next holiday meal. Chop the mushrooms into small bit sized pieces. Then put oil in the bottom of a sauce pan and sauté the mushrooms in the oil on medium heat. Sprinkle the salt over the mushrooms and cook mushrooms until they get darker and release their juices. Add dairy free milk, garlic powder, paprika, black pepper, and soy sauce (optional) and heat until the soup just barely begins to bubble then reduce the heat to low. In a separate bowl, mix the cornstarch and water. Stir until it dissolves completely. Pour the cornstarch mixture into the hot soup stirring constantly. Continue to heat the soup on low until it thickens and just starts to bubble then turn off the heat. Place green beans in the bottom of a casserole dish and pour the soup over the beans. Sprinkle fried onions over top of the casserole. Bake for 35- 45 minutes until it is bubbly and the onions are golden brown. (Bake time will vary depending on size of the beans or if you used fresh or frozen). Let it cool down for about 10 minutes before serving to set up and get more firm. If you don't want your fried onions to be to browned, sprinkle them on after you bake the casserole for about 25 minutes. You will know when it's done, when the casserole is bubbling and you can easily stick a for in your beans. If you don't like fried onion or can't find them, you can sprinkle crushed up crackers of choice on top. Can I bake this ahead and then reheat? My whole planned dinner requires different oven temperatures and I need some things prepared ahead. Bad planning on my part, I know. Hi Mary Beth – Yes, you can make this ahead of time and re-heat. It might be a good thing to make the day before even and then re-heat about 20 minutes before you are ready to eat. You may want to bake it without the onions, then add the onions when you re-heat it so they don’t get mushy sitting in the casserole for a long time. Enjoy! Thank you. My dinner is tomorrow and I have the casserole in the oven as I write. I did put the onions on first, after a debate with myself, and have covered them loosely with foil. If they go too soft I will just replace them tomorrow, as I have plenty. I will let you know how that works. This was such a hit at Thanksgiving, I’m making it again for Christmas. There are only a few of us I made this for, but everyone was fighting over it! I used oat milk, it was delectable! I just made this for dinner yesterday. It was delicious! It tasted just like the green bean casserole that I remember from childhood. Even my omni husband loved it! Thanks so much for the recipe! we NEVER have this casserole at the holidays, and I KNOW my midwestern husband would love it! saving this to make this year, I cannot wait!